We’re finally breaking out of the red Burgundy streak with this one! Surprisingly enough I found this bottle occupying the shelves of my local wine and liquor store a few feet behind bullet proof glass. Although I usually only go here to find a cheap bottle of table wine and don’t really expect to find anything of a worthy note to find Marques De Riscal on the shelves was quite a surprise I assure you. I didn’t go in looking for a Rioja but I couldn’t help but grab a bottle and take it for a test drive. 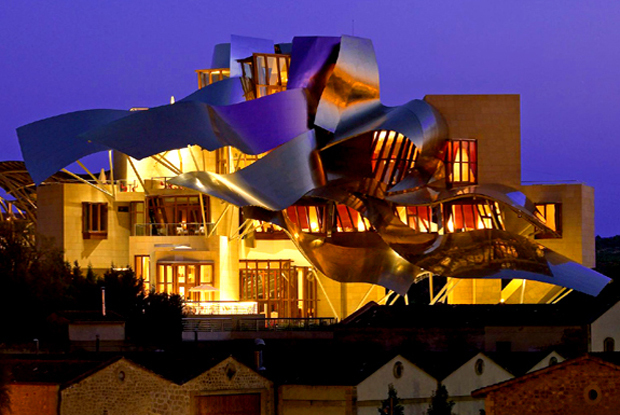 Rioja is a Spanish wine region in the north-east of the country laying along the river Ebro. 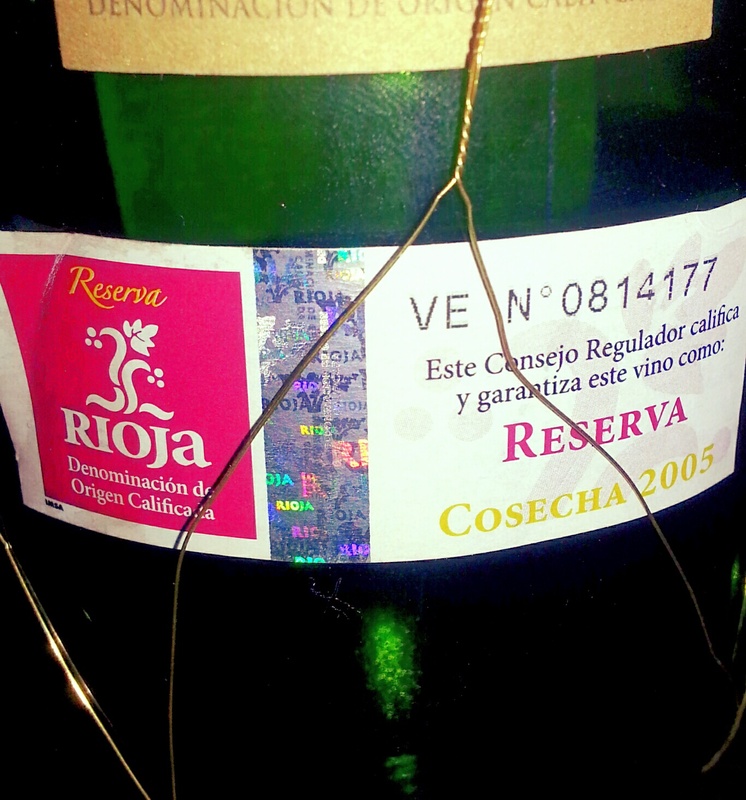 Some believe Rioja is actually a derivative of Rio Oja a small tributary of the Ebro river. Rioja’s red wines are predominately made from the tempranillo grape though a few other grapes are used in small amounts to add flavor nuances and variations from the tradition bold flavors of the tempranillo grapes. The Rioja region is broken down into three main sub-appellations Rioja Alavesa, Rioja Alta, and Rioja Baja. Riojas are also broken down by three quality levels which are all aged in oak for at least 1 year (Gran Reserva aged 2 years) and then separated by their respective aging in the bottle : Crianza’s aged 1 year, Reserva’s aged 2 years, Gran Reserva’s aged 3 years in bottles after oak barrel aging. Quality levels if not stated on the front are always donated by an official seal on the reverse side of the bottle. Occasionally you will come across bottles of Rioja wrapped in wire which are known as “red’s” or “malla’s.” These wire cages were originally stronger and were used in the early nineteenth century to prevent scrupulous Bodega owners from refilling Rioja bottles with less desirable wines, re corking them and selling them. Founded in 1858 by Guillermo Hurtado de Amezaga Marques de Riscal is one of Rioja’s oldest wineries. Today the vineyard is also home to an amazing hotel and a restaurant that sports a Michelin star. Medium + Body 13.5 % Alc By Vol. This Rioja starts off with heavier red qualities, bursting with scents of young new leather and dark cherries. Subtle sweet smells tickle the nose with brown sugar and molasses. On the palate this older Rioja hits with smoky dark chocolate and undertones of black olives, black licorice and slight hints of cayenne pepper. Over all the body of this wine posses medium tannins rounded out with a medium + acidity and long finish. This wine exudes Spain if you close your eyes while you drink it it’s almost as if you’re sitting at the winery overlooking the small Spanish buildings with the rolling mountains of Rioja as its backdrop.